Teams improve their time to delivery by managing the work of all team members, and where their tasks are directly linked to project execution. Many teams face the pressure of improving their time to delivery. But improving your time to delivery requires that you have a solid grasp of the scope of the project, which includes the work needed to elaborate the requirements, the design and implementation effort, as well as the size of the test effort, often defined in a test plan. The planning capability in Rational Team Concert provides the backbone for the real-time planning. When working in an integrated, cross-functional team, planning for all team members becomes an imperative for improving time to delivery. 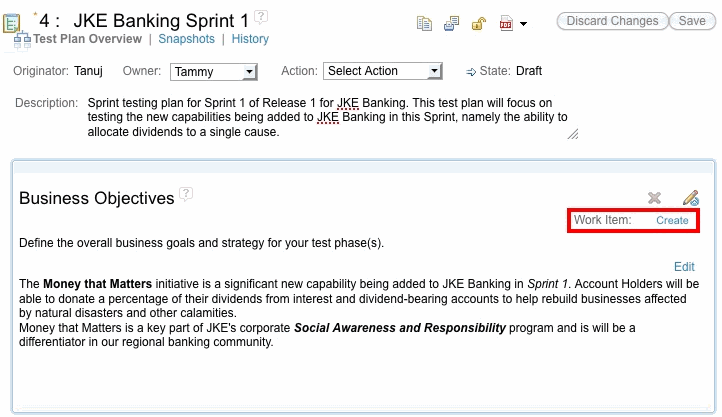 The Links tab now allows you link to requirements collections and test plans. In addition you can browse requirement collections in place. Select a collection to see all requirements from it. Hover over the link and a rich hover shows the requirement details and all the plan items that implement that requirement. And if there are no requirements you can create them right in context. The new architecture allows us to reuse the same application across multiple products. For you, this means you can create a CLM lifecycle project where all team members share the same application and have access to the same data, further breaking organizational silos. Planning can now include the work of the entire team. Analysts, developers and testers can share the same work item capability. Project managers can now estimate and include the work across the entire team to include estimating the effort to elaborate the requirements, define test cases, write test scripts and so forth. This reduces surprises that can delay a release beyond the anticipated, while improving the teams understanding of the complete scope of the project. Rational DOORS Next Generation and Rational Quality Manager projects can now use any OSLC compliant change management project to manage their tasks. That means tasks management can be delegated to a Rational Team Concert and Clear Quest project and you can use the full set of capabilities offered by these products, such as work item customization, querying, planning and work item specific dashboards and reporting. Task projects can be shared by multiple test or requirement projects or even shared across domains. Business analysts keep track of which requirement documents still need to be composed and which documents need to be updated. Testers create tasks to keep track of which test cases and test plans need to be created. Task are used to collect the test plan inputs such as quality objectives and business objectives. 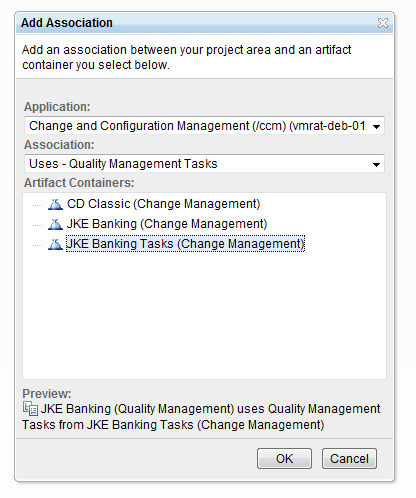 To define a task provider, go to the project area administration page and configure the change management project that manages the tasks. Requirements can now be managed in a common requirements management application. Testers can author test requirements, and analysts can author the business requirements in the same application. This provides greater transparency and collaboration on the project requirements. Additionally test teams who only purchase Quality Professional licenses have access to authoring test requirements as part of their client license. To step up to rich requirements definitions, multiple requirement types and administration, test teams merely purchase an Analyst client license, and the rich editing capability is available with no additional software installation. Sometimes requirements are incorrectly, or insufficiently written. Or sometimes we need to change requirements that have already been written. To track these types of changes, we’ve introduced a new link type called “Tracks/ Tracked by.” Defects can now be filed against a requirement, where the Defect Tracks a Requirement. The requirement is tracked by the defect. 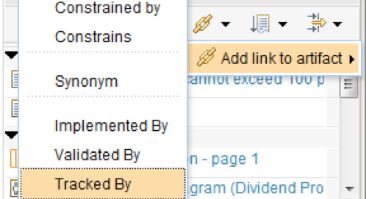 For tracking changes to the requirement a work item is linked to the requirement using this link type. Team members can subscribe to the work item, comment and be notified when others comment on the requirement. A query is provided to identify all requirements with a tracked by link. Examples for use are: All requirements tracked by defects gives the analyst a view into which requirements to ‘fix.’ All requirements tracked by tasks can be named “New requirements change requests” to notify the team of the intent to change a requirement. Was this information helpful? Yes No 0 people rated this as helpful. Let us know how we can improve this information.